Over the last several days, Econet announced through its website a promotion reduction of international tariff rates by up to (emphasis ours) 25% for countries in the region and to 20 cents a minute for calls to the UK, the US, China and Canada. Before this, the last reduction was in February last year. This latest round goes lower. Ads published in the press today also announce the reduction, but unlike the internet announcement, don’t make it clear that this is just a promotion and that it will likely expire after 1, 2 or 3 months. POTRAZ should force to make this clear really! Again, we emphasise the “up to“ for countries in the region so for some of these destinations it may actually be 20% or if they’re being extra sneaky here, even 5% or less. The decrease is only marginal so we’re not too excited really. Calls at 10 cents would have been a start. But there’s a bigger second issue. 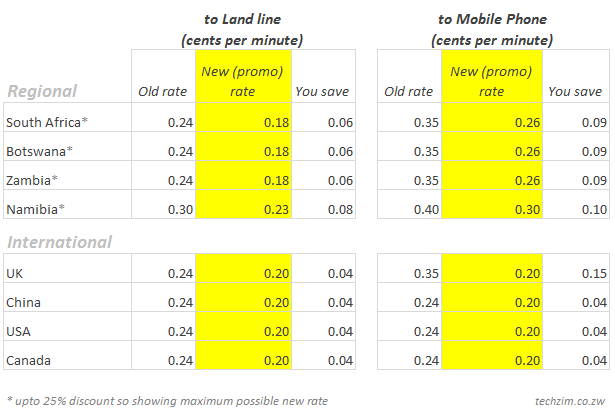 It’s tempting to compare these new rate to the other local mobile and fixed operators, but the reality is that Telecel, NetOne, TelOne etc… are not the meanest competition to Econet’s rates right now. The internet is. And it’s unstoppably increasingly so into the future. WhatsApp, WeChat, Viber, Skype and other such internet enabled services are a bigger threat Econet’s traditional international voice revenue that Telecel and the others can ever be. Not even the new VoIP operators are that big a threat. I can’t even remember the last time I had to call an international number using my mobile phone. It’s almost always Skype, Facebook or, if not voice, then just WhatsApp, WeChat etc… So yes, not quite exciting. Especially so as Econet itself already offers unlimited WhatsApp and Facebook bundles at amazingly low prices. 3 cents/min to U.K.; 2 cents/min to USA and 6.5 cents/min to RSA. Per second billing. Unbeatable hey! Im not so sure of what percentage of the mass actually lives off skype/hangouts/viber for international calls. Whatsapp, yes a huge lot is on whatsapp but then again imagine having to only IM your spouse all the time. Therefore, whilst your opinion of the competition to voice is valid, to another extent its invalidated by the point i am trying to raise. Unfortunately, in as much as a reader/writer of this blog may quickly jump to the comparisons with IM and VoIP as key, let us not quickly forget the other ‘laymen’ users of the mobile network; users i believe will welcome such a move with more enthusiasm than exuded in thi article. True that some laymen will be enthusiastic about it, and I’m sure Econet were quite deliberate in coming up with those numbers. They know the amount of international traffic they get currently, and how this may jump with such a promo. But i think that market is being eaten away fast as everyday they discover there’s a cheaper way to stay in touch with loved ones. if a person is so low income they can’t afford a $31 broadband package by NetOne, Africom, PowerTel etc… at home, where would they get the money to spend on international calls? It’s usually likely that they can afford the broadband already but just don’t know it yet and are still paying more in voice calls instead. And even if they really can’t afford the broadband, isn’t it cheaper for the person in the UK/US/Canada to call Zimbabwe than the 20 cents Econet is charging? Facebook does live voice right now already. Econet itself is pushing for cheaper and cheaper smartphones with the new low now $53. All these things are staked against this tariff slash. It is quite true that some can afford that low price $31pm package and still not know how to trim phone bill with it. I don’t have hard facts (thus relegating my post to ‘opinion’) i really think there are tonnes of pple out there who are not so privy to such information; VoIP, IM and all. I work in a place where i get requests to put whatsapp on fones, and you know how Google Play requires a Gmail account to sign in; you would be surprised how many Devices I end up installing Whatsapp by sending APKs via bluetooth. Munhu anenge asitorina email yacho. A good chunk of the diasporans are not so keen on Phone spend, especially international. They are used to the many local minutes that come with their contracts so much that having to buy extra Credit to call Zim is usually a no no. It might be cheaper yes, but i think it is more to do with the extra sweat and less sleeping hours some of them have to endure. Whatsapp experience with the wife might me awesome, yes, but one still needs to hear that beautiful voice time and again. I still await to test FB voice quality, as well as Whatsapp’s when its launched. If it is as good as circuit switched voice then no problem. FB in itself does not really cut above the market for else other than status updates. This claim could be supported by the withdrawal of email services. Hashtagging has not brought about discussions in the way twitter does, and their IM just does not do it for me. FB failed to convert its popularity to drive email uptake, and no wonder its Voice offering at this point is not anything of a Big Bang either. You speak and do your stuff from a very Technologically informed vantage point. I just doubt Zimbo masses are that tech savvy to still push such offerings just to avoid Econet..
its very simple for African operators to kill of the competition with internet apps that give a voice service, they simply throttle the bandwidth to those services and make it lousy and erratic to use. Vodacom and MTN do that pretty well which is a pity for the users.